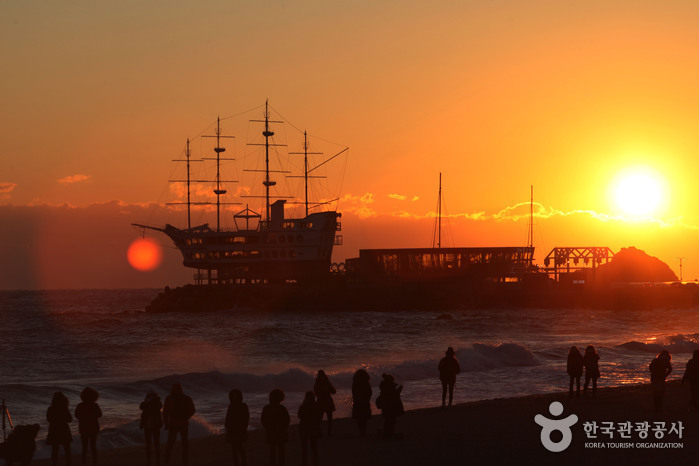 Located in Gangneung, Gangwon-do, Jeongdongjin is a picturesque area with a quaint, little railway station standing alongside the sandy beach. Although long since a favorite spot among the locals, the area gained widespread popularity after being chosen as the filming location for the popular soap opera Moraeshigae (Hourglass) and has since become a favorite haunt for drama lovers on the weekends. The combination of the area’s railroad station, beach, and groves of pine trees makes Jeongdongjin a very peaceful and romantic mini getaway. The highlight of the Jeongdongjin tour, however, is the sunrise. The early morning sun reaching out over the ocean and outlining the dewy silhouettes of the station and surrounding pines is a sight that is straight out of a fairy tale. During the New Year, Jeongdongjin Sunrise Park is the location of the Sunrise Festival and the ceremonial ‘turning of the hourglass,’ signifying the changing year.